Carbon Based has been rolling along for some time, and I'm trying an experiment. The blog now appears on my Facebook page. Facebook makes many uneasy, I know. Nature itself dislikes "curated" walled gardens, which smack of the sort of monoculture that evolutionary biologists warn us about. I'm not happy about it myself. I feel like a fogey grumbling about the dullness and fatuity of most social media. It feels like I'm moving from an elegant, quiet, appealing coffee house to a food court at the mall. But the numbers are much larger and more consistent on Facebook, so I'm reluctantly making the switch. 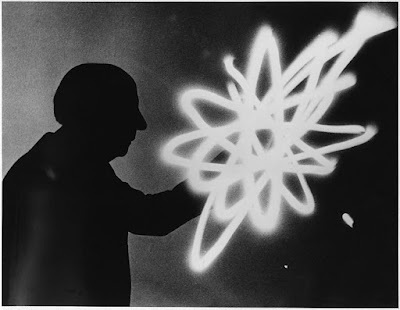 Ease of posting is another consideration -- I can fling posts much faster via Facebook. One problem -- some of my readers aren't connected with me on Facebook. You read Carbon Based for its current news of floods, disasters, heat waves, climate modeling, risk, and other uproarious topics. You're not interested in puppy videos, unless the puppy has devised a new rescue device that firefighters can use, or a new method of no-till agriculture that halts nitrogen run-off. The puppy trying to fill a plastic pool with a garden hose just lacks the heft you've come to expect from Carbon Based. If you'd like to keep abreast of the latest news in climate change adaptation, just hit the friend button. I may tire of Facebook and migrate back to Blogger, which has served me well for more than nine years. But for now, it's social media or bust. I hope you join me. University of Utah News Center: In the virtual worlds of climate modeling, forests and other vegetation are assumed to bounce back quickly from extreme drought. But that assumption is far off the mark, according to a new study of drought impacts at forest sites worldwide. Living trees took an average of two to four years to recover and resume normal growth rates after droughts ended, researchers report today in the journal Science. Forest trees play a big role in buffering the impact of human-induced climate change by removing massive amounts of carbon dioxide emissions from the atmosphere and incorporating the carbon into woody tissues. The finding that drought stress sets back tree growth for years suggests that Earth’s forests are capable of storing less carbon than climate models have calculated. “If forests are not as good at taking up carbon dioxide, this means climate change would speed up,” says Anderegg, who performed much of the work on this study while at Princeton University. He co-authored the study with colleagues at Princeton, Northern Arizona University, University of Nevada-Reno, Pyrenean Institute Of Ecology, University of New Mexico, Arizona State University, U.S. Forest Service Rocky Mountain Research Station, NOAA Geophysical Fluid Dynamics Laboratory, and the Lamont-Doherty Earth Observatory of Columbia University. The rate of recovery from drought is largely unknown for the vast majority of tree species. Anderegg and colleagues carefully measured the recovery of tree stem growth after severe droughts since 1948 at more than 1,300 forest sites around the earth using records from the International Tree Ring Data Bank. Tree rings provide a convenient history of wood growth and track carbon uptake of the ecosystem in which the tree grew. Tierney Smith in EcoWatch: As 2015 shapes up to be the hottest year on record, scientists warn the world could be halfway towards surpassing countries’ self-set red line of 2C temperature rise. New research commissioned by the New Scientist shows that four out of the five major surface temperature records are set to pass the 1C point this year, measured from the 1850-1899 average. 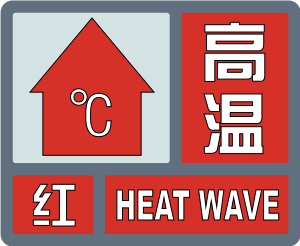 At 1C climate change is already affecting the world’s poorest and most vulnerable populations as warming brings escalating sea level rise and more intense and volatile weather extremes. Rising temperatures and changing weather patterns already increase heat-related illnesses, enhance the spread of disease, reduce crop yields and threaten access to clean water and could result in forced migration, conflict and social disruption. Bold climate action will save huge numbers of lives and produce significant cost savings in the health sector. Direct health impacts from climate change are expected to cost the world US$2-4 billion a year by 2030. In WHO’s announcement and in results it published today in the medical journal, The Lancet, the UN health agency said the results from an interim analysis of trials in Guinea show that the VSV-EBOV vaccine is highly effective against Ebola, which has killed more than 11,000 people in Liberia, Sierra Leone, as well as Guinea, in an epidemic that has proved devastating for the region. 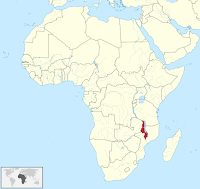 The Guinea vaccination trial began in affected communities on 23 March 2015 to evaluate the efficacy, effectiveness and safety of a single dose of the vaccine VSV-EBOV by using a so-called ring vaccination strategy, the agency said. “To date, over 4,000 close contacts of almost 100 Ebola patients, including family members, neighbours, and co-workers, have voluntarily participated in the trial,” it said. Sasha Harris-Lovett in Sci-Tech Today: Keep the sandbags handy. Previous flood assessments have underestimated the actual risk of dangerous floods in many parts of the country, according to a new study. By looking back at the historical weather records, researchers have found an important synergy between two flood risk factors in coastal zones that has often gone overlooked. 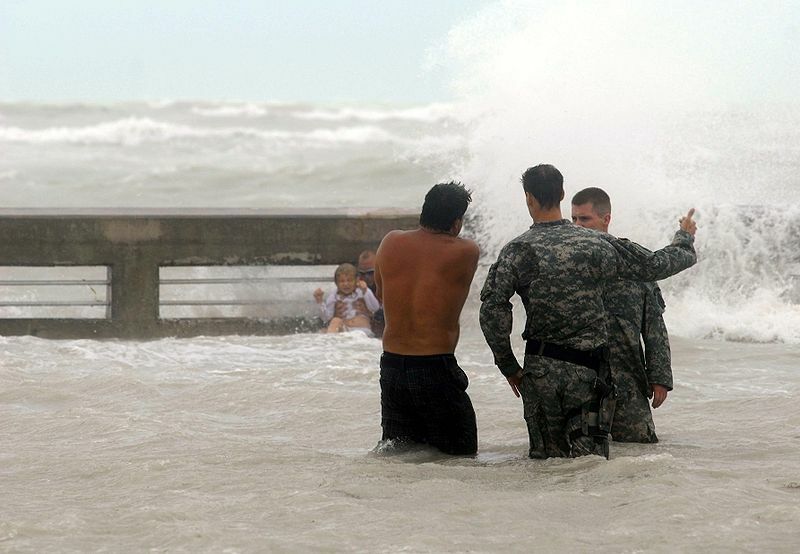 In the past, engineers usually determined flood risk for coastal areas by looking at the separate probabilities of intense rainfall and the especially high seas caused by raging wind, called storm surges. 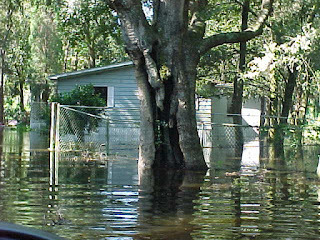 But some of the worst floods in coastal areas are caused by the unfortunate concurrence of big storm surges with high rainfall -- a double-whammy for flooding, because it can result in the sea spilling over onto land while rivers and urban drainage systems overflow onto the streets. By examining these two phenomena together, researchers showed that heavy precipitation and high seas are occurring in tandem more often in many coastal cities, especially along the Gulf and Atlantic coasts of the U.S. The results were published this week in Nature Climate Change. "This is an important yet less studied aspect of vulnerability along the coastline," said Shaleen Jain, a civil and environmental engineer at the University of Maine and one of the authors of the study. Nearly 40% of the U.S. population lives in coastal counties, researchers noted. The scientists combed through historical records of rainfall, tide gauge readings and hurricane tracks dating back to 1900 for 30 port cities around the continental United States. They noted all the instances where high storm surges corresponded to strong rainfall. 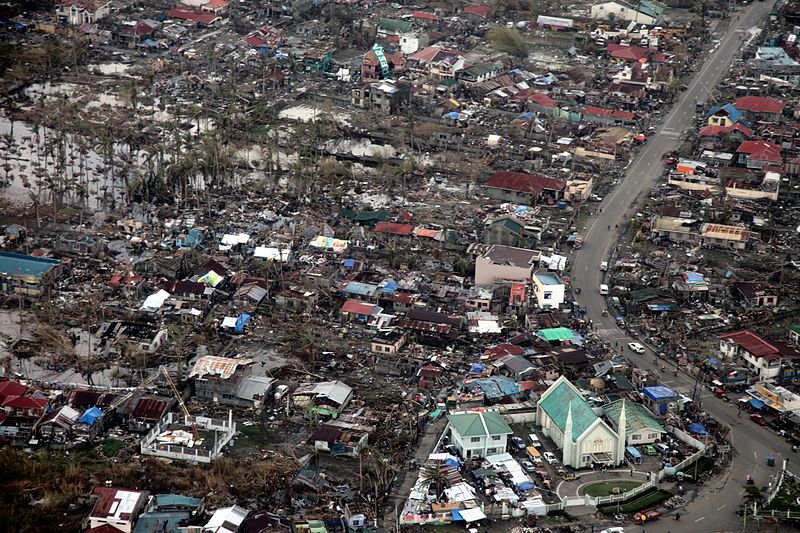 Bangkok Post via AFP: The Philippines has not done enough to rebuild after Super Typhoon Haiyan, as thousands remain in shanties without power or water for nearly two years, a United Nations representative said Saturday. Many storm survivors in the central region have had to endure relocating to evacuation camps up to three times since Haiyan struck in 2013, and the sub-standard housing leaves them vulnerable to future typhoons, said Chaloka Beyani, UN special rapporteur on the human rights of internally displaced persons. "While the government is to be commended in terms of its immediate responses, its attention to ensuring sustainable durable solutions for IDPs (internally displaced persons) remains inadequate to date," Beyani said in a statement posted on the UN website. Beyani was in the Philippines in late July to check on the government's handling of people displaced by Haiyan and by fighting between the military and Muslim rebels in the south. Sam Otieno in SciDev.net: Agriculture should receive more attention as climate change could affect rainfall rates and patterns, resulting in more droughts and increased catastrophic flooding that could affect food production across the world, according to experts. At a meeting of the United Nations Framework Convention on Climate Change (UNFCC) panel last month (1-11 June) in Bonn, Germany, the experts discussed the need to make agriculture more prominent in a global treaty on climate change expected to be signed in Paris, France in November-December this year. Scientists have warned that Sub-Saharan Africa is particularly vulnerable to the threat of El Nino as 95 per cent of its crop production area relies entirely on rainfall. Under climate change, this means that multiple stresses such as drought interact, causing large decreases in productivity. 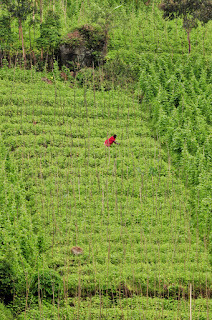 The UNFCC Subsidiary Body for Scientific and Technological Advice (SBSTA) that marshals scientific evidence to support countries’ decisions to be included in the treaty, says that a central objective of agricultural research, extension, education and rural credit systems must be to help farmers and producers successfully adapt to changing climatic conditions. Environmental News Network: In the last seven years, an estimated one person every second has been forced to flee their home by a natural disaster, with 19.3 million people forced to flee their homes in 2014 alone, according to a new report. ide advance towards the adoption of a post-2015 global agenda, the time has never been better to address it. In the report, the Internal Displacement Monitoring Centre (IDMC) of the Norwegian Refugee Council (NRC) released today its global report, The Global Estimates: People displaced by disasters. The report reveals how, in 2014, 17.5 million people were forced to flee their homes by disasters brought on by weather-related hazards such as floods and storms, and 1.7 million by geophysical hazards such as earthquakes. 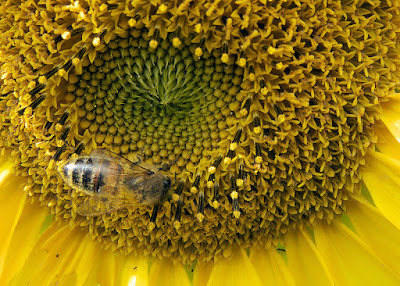 Deborah Smith in the University of New South Wales Newsroom: The first worldwide study of animals and the seeds they eat has overturned a long-held assumption – that large animals mainly eat large seeds. The finding by UNSW Australia scientists has implications for conservation showing that a wider variety of plants than is often thought could be at risk if large animals go extinct and do not disperse their seeds. In a comprehensive study, UNSW’s Si-Chong Chen and Professor Angela Moles compiled and analysed data on more than 13,000 animal-seed interactions, based on previously published reports. “It is the first broad-scale study of the relationship between animal body mass and ingested seed size ever undertaken,” says Ms Chen, a PhD candidate in the UNSW School of Biological, Earth and Environmental Sciences. 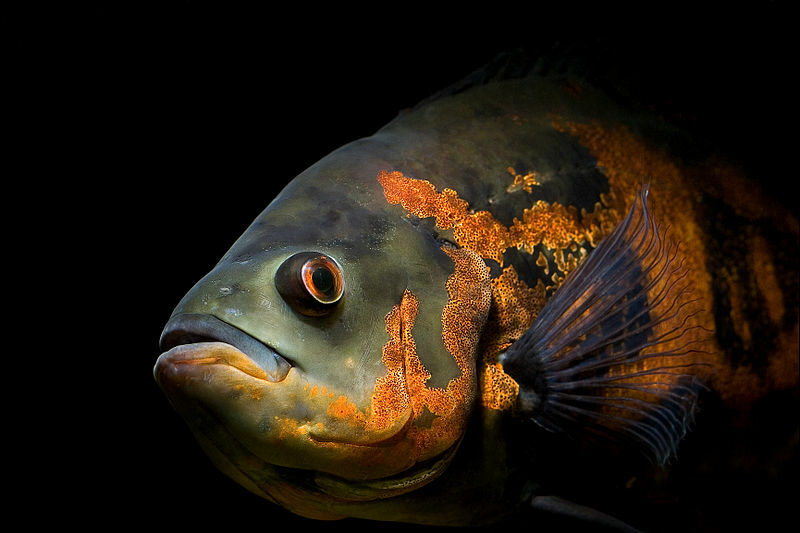 “We covered all vertebrate groups – fish, amphibians, reptiles, birds and mammals. And we included animals from many different areas – from the Arctic tundra to the tropical rainforests.”...The smallest seeds in the study were the tiny seeds of the mountain snowberry, and they were eaten by the smallest animals in the study – skinks on the Chatham Islands near New Zealand. The largest seeds were the 9-centimetre long seeds of the African tropical forest tree, Balanites wilsonia. They were eaten by the largest animals in the study – 4-tonne African elephants. University of Illinois News Bureau: A study of the West Nile virus risk associated with “dry” water-detention basins in Central Illinois took an unexpected turn when land managers started mowing the basins. The mowing of wetland plants in basins that failed to drain properly led to a boom in populations of Culex pipiens mosquitoes, which can carry and transmit the deadly virus, researchers report. 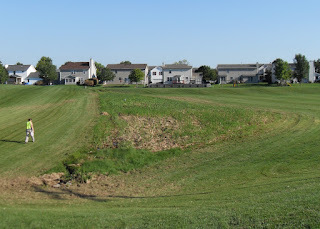 ...The team, led by University of Illinois postdoctoral researcher Andrew Mackay, found that mowing down cattails and phragmites, two invasive plants that tend to permeate stormwater basins, adds a lot of plant debris to the water. “We suspect bacteria quickly colonize the waterborne debris, and mosquito larvae feed on the bacteria,” said Illinois entomology professor Brian Allan, a co-author on the study with Mackay, Illinois Natural History Survey entomologist Ephantus Muturi and U. of I. natural resources and environmental sciences professor Michael Ward. l roosts of birds,” he said. “And we thought that was important because birds are the natural reservoir hosts of West Nile Virus.” The researchers suspected that a bird roost near a mosquito nursery might increase the West Nile virus risk to people living nearby. Tania Rabesandratana in SciDev.net: The first malaria vaccine has received the green light from European regulators today, opening the door for vaccination campaigns for infants in Africa. This a big leap forward for the RTS,S vaccine after decades of research. Also known under the commercial name Mosquirix, the vaccine is intended to protect children aged six weeks to 17 months against the mosquito-transmitted Plasmodium falciparum parasite that causes malaria. “RTS,S is an imperfect vaccine, providing only partial protection against clinical malaria,” says Brian Greenwood, a clinical tropical medicine researcher at the London School of Hygiene & Tropical Medicine in the United Kingdom. Nevertheless, today’s approval is an “important landmark” that can help control malaria where other methods, such as using bed nets impregnated with insecticides, are not effective enough, Greenwood adds. 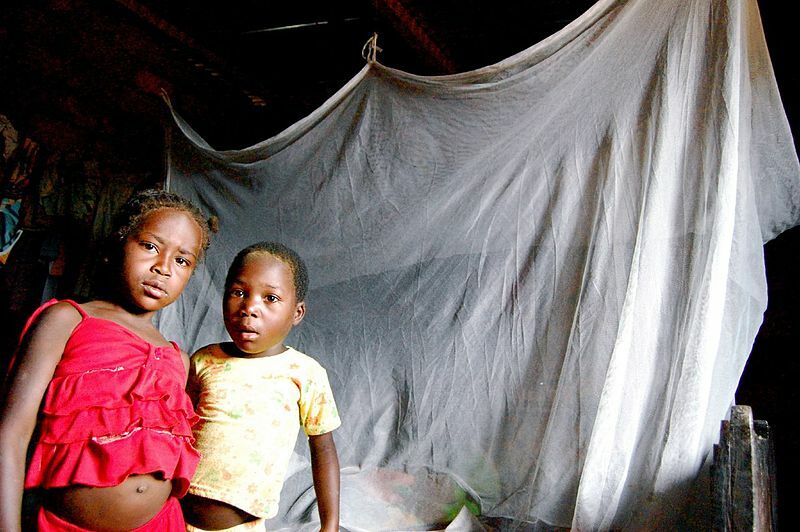 According to the World Health Organization, 562,000 people died from malaria in Africa in 2013, of whom 82 per cent were children under five. Sean Waters in the Standard Daily: Naegleria fowleri, a deadly brain-eating amoeba is currently under investigations in the recent death of a Minnesota teen, following findings that the single-celled organism is now thriving in northern US waters due to help from climate change. Climate change is causing the summers to get hotter at this period, and this amoeba is known to thrive in warmer waters of southern United States – according to Dr. Bruce Hirsch, an infectious diseases specialist at North Shore University Hospital in Manhasset, NY. “Climate change may be playing a role,” Hirsch said. And then the US Centers for Disease Control and Prevention (CDC) says the amoeba is “heat-loving.” Despite the fact that the Naegleria fowleri common in several US rivers and lakes, the chances of getting infected with it inside your brain are low, and the CDC said only 35 people were infected between 2005-2014 within the US. 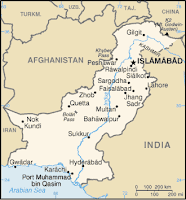 Business Mirror via AP: The devastating heat wave that struck southern Pakistan last weekend is slowly subsiding but the toll was still climbing on Thursday to a total of 860 confirmed deaths, a senior health official said. Pakistan’s deadliest heat wave on record comes just weeks after soaring temperatures caused nearly 2,200 deaths in neighboring India, raising fears that South Asia could be seeing some of the devastating effects of human-caused climate change. 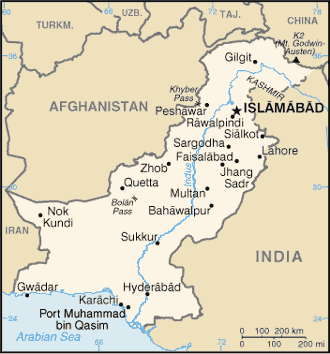 The crisis centered in the southern port city of Karachi was worsened by poor local services, including a faulty power grid and shortages of potable water. And the heat wave struck as the city’s Muslim majority was observing the dawn-to-dusk fasting month of Ramadan. Jam Mehtab Hussain, the provincial health minister in the southern Sindh province, of which Karachi is the capital, said that despite lower temperatures people were still being admitted to hospitals with heat-related ailments—though in smaller numbers than in previous days. A press release from NASA: Greenland's glaciers flowing into the ocean are grounded deeper below sea level than previously measured, allowing intruding ocean water to badly undercut the glacier faces. 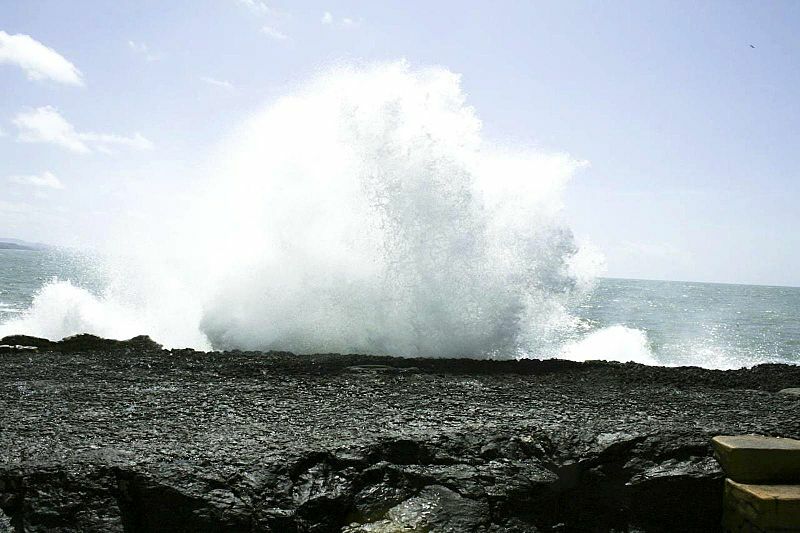 That process will raise sea levels around the world much faster than currently estimated, according to a team of researchers led by Eric Rignot of the University of California, Irvine (UCI), and NASA's Jet Propulsion Laboratory, Pasadena, California. 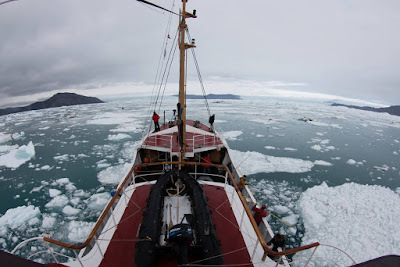 The researchers battled rough waters and an onslaught of icebergs for three summers to map the remote channels below Greenland's marine-terminating glaciers for the first time. Their results have been accepted for publication in the journal Geophysical Research Letters and are now available online. "Measurements are challenging to obtain beneath hundreds of meters of seawater in poorly charted, ice-infested fjords," Rignot wrote. He and co-authors Ian Fenty of JPL, Cilan Cai and Yun Xu of UCI, and Chris Kemp of Terrasond Ltd., Seattle, obtained and analyzed around-the-clock measurements of the depth, salinity and temperature of channel waters and their intersection with the coastal edge of Greenland's ice sheet. Imelda V. Abano at InterAksyon.com: Experts meeting here say climate-proofing a city or coastline is urgently needed to protect millions of people and key infrastructure. 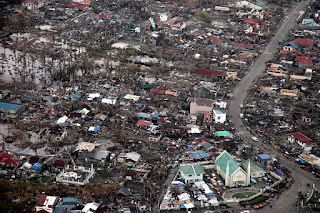 From Manila to New York, cities and coastal areas across the globe are increasingly vulnerable to the impacts of climate change coupled with population growth and poverty. The adaptations prompted by climate change are meant to minimize risks from extreme weather events, powerful storm surges, sea level rise, droughts, rising temperatures and other effects of a changing climate. Urban populations, according to the United Nations, is projected to increase from 3.9 billion in 2014 to 6.3 billion in 2050. 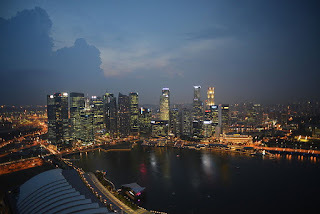 Asia, the most climate-vulnerable region despite its lower level of urbanization, is home to 53 percent of the world's urban population, followed by Europe with 14 percent and Latin America and the Caribbean with 13 percent. 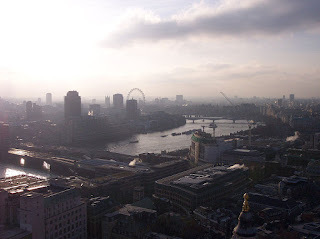 Smart planning of cities and coastal areas, such as building or planning defenses, securing water supplies or moving people to higher ground, is essential to prepare for the climatic forces, said Steven Wade, head of the Scientific Consultancy at the Met Office, a United Kingdom-based national weather service. Maria Galluci in the International Business Times: Private investors risk losing more than $4 trillion in assets due to the devastating effects of climate change. Rising sea levels, intense flooding and more severe storms threaten to wipe out or diminish portfolios due to property damage, weaker growth and lower asset returns, the Economist Intelligence Unit said in a report Friday. Assets at stake amount to roughly one-fourth of U.S. gross domestic product. The number could swell to nearly $14 trillion if the Earth’s temperatures warm by a staggering 6 degrees Celsius (10.8 degrees Fahrenheit) compared to the pre-industrial era. From the public-sector perspective, extreme warming represents value losses of $43 trillion, or 30 percent of the entire stock of the world’s manageable assets, the report said. “Institutional investors need to assess their climate-related risks and take steps to mitigate them; very few have begun to do this,” the report said. 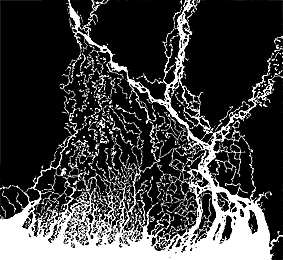 Jon Lawn and Michele Leone in the Dhaka Tribune (Bangladesh): An abundance of scientific evidence shows that the people living in deltas have an increased vulnerability to sea-level rise and effects of climate change. 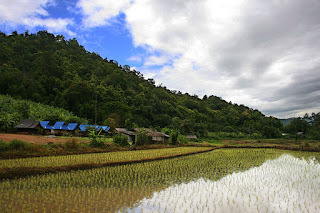 In 2007, the Intergovernmental Panel on Climate Change (IPCC) reported that low-latitude and less developed areas generally face greater risk, for example in dry areas and mega-deltas. These risks increase vulnerability of specific groups such as the poor. The poor and vulnerable have migrated in different forms to cope with the disruptions climatic changes has brought upon their lives. Research is crucial to understanding the suitability of migration as an adaptation option to the threats of climate change, and the implications migration has on society and the environment. There is a new project tackling these issues in Bangladesh: a research collaboration between the Bangladesh University of Engineering and Technology (BUET) and the University of Southampton in the UK, which is part of a larger initiative studying migration and adaptation across Africa and South Asia. The “Deltas, vulnerability and Climate Change: Migration and Adaptation” (DECCMA) project is a five-year long program of applied research which started in early 2014, focusing on the potential and limits of adaptation options in deltaic environments. The project will analyse the impacts of climate change and changes in other environmental pressures (such as demand for agriculture or damming rivers) across three contrasting deltas: The Ganges-Brahmaputra-Meghna in both Bangladesh and West Bengal, the Mahanadi delta in India, and the Volta delta in Ghana. The University of Southampton provides the overall leadon the project, partnering with BUET, Jadavpur University in Kolkata, India and the University of Ghana, who lead research in the delta study sites. Blue & Green Tomorrow: Mangrove forests could play a crucial role in protecting coastal areas from sea level rise caused by climate change, according to new research involving the University of Southampton. 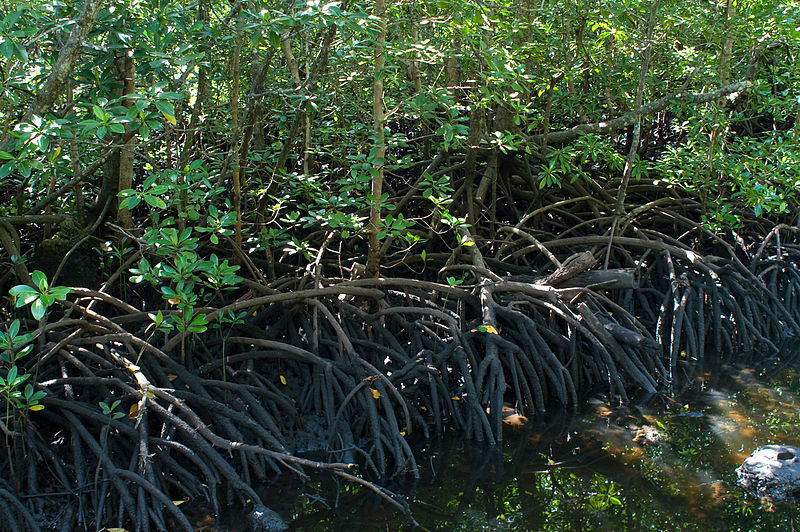 A joint study between researchers at the University of Southampton along with colleagues from the Universities of Auckland and Waikato in New Zealand used leading-edge mathematical simulations to study how mangrove forests respond to elevated sea levels. Taking New Zealand mangrove data as the basis of a new modelling system, the team were able to predict what will happen to different types of estuaries and river deltas when sea levels rise. 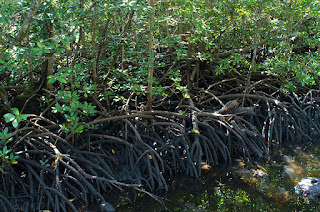 They found areas without mangroves are likely to widen from erosion and more water will encroach inwards, whereas mangrove regions prevent this effect – which is likely due to soil building up around their mesh-like roots and acting to reduce energy from waves and tidal currents. Coastal estuaries and recesses in coastlines that form bays receive the run-off from erosion on steep catchments, which give them the tendency to fill in over time. As they infill, the movement of the tidal currents over the shallow areas create networks of sandbanks and channels. The sand banks grow upward to keep pace with water-level changes, while the channels get deeper to efficiently drain the excess water out to sea. The researchers’ latest work shows that mangroves can facilitate this process, by adding leaf and root structures into the accumulating sediment, which increase the elevation while enhancing the trapping of new sediment arriving from the catchment. homes. Sixty-two people were killed and thousands more risked disease. Now, thanks to nearly US $600,000 from a special UN emergency fund, UNHCR Malawi has given affected populations a chance to rebuild their lives. 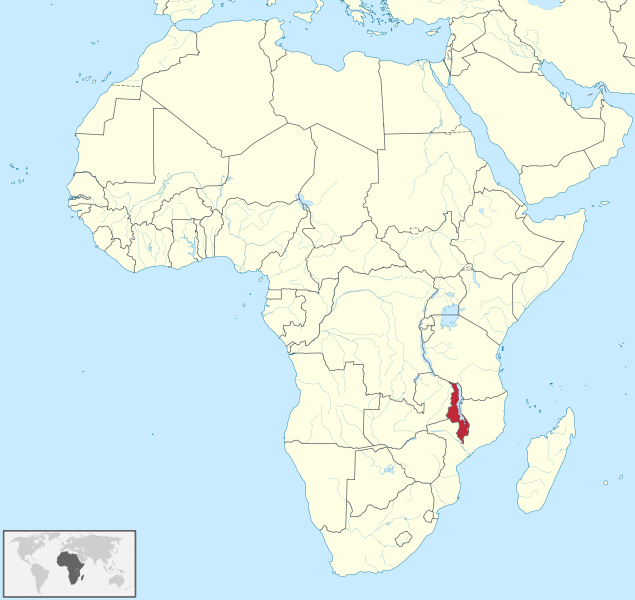 The UN's Central Emergency Response Fund (CERF) has enabled UNHCR Malawi to provide core relief items to 8,120 households in the worst-hit districts of Machinga, Zomba, Mulanje and Phalombe. Between May 24 and June 4 this year, kitchen sets, blankets, sleeping mats and insecticide-treated mosquito nets were distributed to thankful locals. Women were particularly excited by the kitchen sets, having had to try and find work to raise money to buy cooking pots, plates, cups, and other household items lost in the floods. "I was going to sell sand, but now I do not have to," one woman told UNHCR. "It would take me a very long time to recover the lost items, but this has now changed, thanks to UNHCR." Men, too, were grateful for UNHCR's help. "The blankets and mats are just what we needed to pull through this bad weather," said one male recipient. 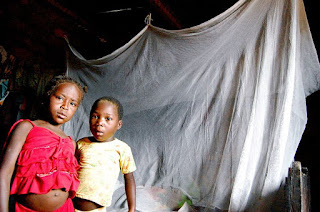 "And the mosquito nets will safe guard against malaria." Terra Daily via SPX: Marine species that already have large ranges are extending their territories fastest in response to climate change, according to new research from University of British Columbia biodiversity experts. The study is one of the first comprehensive looks at how traits--other than thermal niche--impact marine animals' ability to respond to climate change. It could help improve global predictions of how different species redistribute as the oceans warm, and identify species in greatest jeopardy. "We have a bit of a mystery as to why some animals are moving quickly into cooler waters, like the green sea urchin that is decimating kelp forests in Tasmania, while other species aren't moving at all," says UBC biodiversity researcher Jennifer Sunday, lead author of the study. 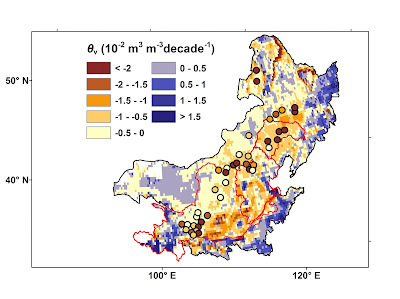 Purdue University News: An important agricultural region in China is drying out, and increased farming may be more to blame than rising temperatures and less rain, according to a study spanning 30 years of data. 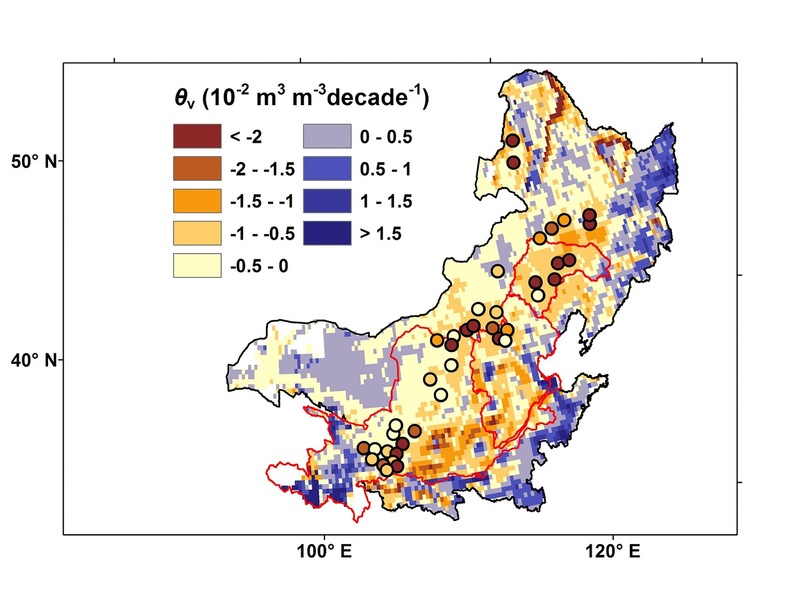 A research team led by Purdue University and China Agricultural University analyzed soil moisture during the growing season in Northern China and found that it has decreased by 6 percent since 1983. The optimal soil-moisture level for farmland is typically 40 percent to 85 percent of the water holding capacity, and the region's soil is now less than 40 percent and getting drier. If this trend continues, the soil may not be able to support crops by as early as 2090, said study leader Qianlai Zhuang, Purdue's William F. and Patty J. Miller Professor of Earth, Atmospheric and Planetary Sciences and Agronomy. "The soil moisture declined by 1.5 to 2.5 percent every decade of the study and, while climate change is still a factor, this water depletion appears to be largely driven by human activities," Zhuang said. "A 10 percent decline in soil moisture over the course of a century would have major implications for agriculture and the fresh water supply in this heavily populated area." Forty percent of the nation's population resides in Northern China, according to the country's population census office. The region also accounts for 65 percent of the nation's cropland, Zhuang said. “Doha has just three days’ supply”: are water shortages the biggest threat to the Middle East? Karim Elgendy in City Metric: Those who visit the Middle East and North Africa from more temperate climates are often struck with how hot and dry the region is, and how scarce its rainfall. Some wonder why cities became established here, and how they continue to exist despite the lack of renewable freshwater. These concerns are not entirely groundless. 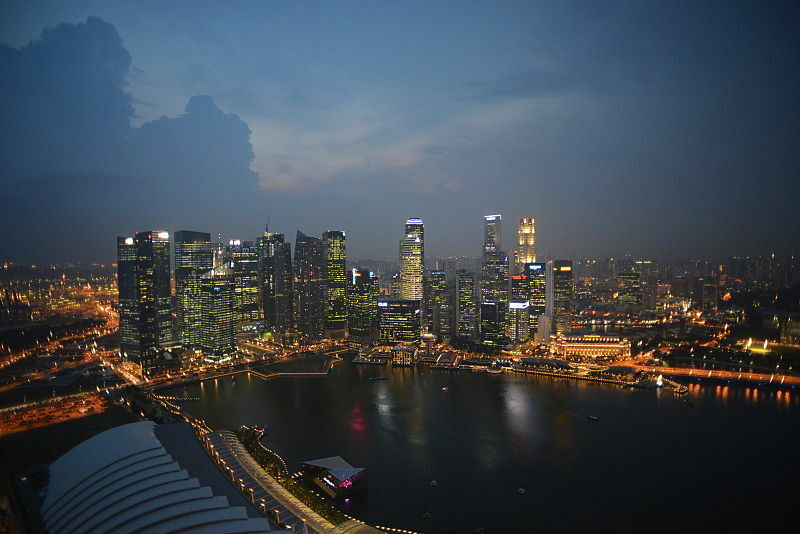 Yet these cities’ existence is not in any way miraculous: it’s merely an example of how one can strike an unsustainable balance between growth and limited resources. The cities in this region may appear unusual today, but like most around the world, most of them grew out of settlements that had access to enough water to sustain life. This is not to say the region’s cities only grew around water sources: have other favourable geographical characteristics, too. Many of the region’s cities benefited – still benefit – from proximity to a water body that moderates their temperature. Quite a few benefited from a geography that allows natural ports: these include Alexandria, Jeddah, Aden, Haifa, Acre, Byblos, Casablanca,Tunis, Muscat, and Manama. Others – Doha, Dubai, Kuwait – began life as small pearling ports. The region’s cities are where they are because of water, not despite the lack of it. Some regional cities benefited from proximity to land trade routes (Aleppo, Marrakesh, Sana’a); others grew near large navigable rivers (Cairo, Baghdad, Basrah). 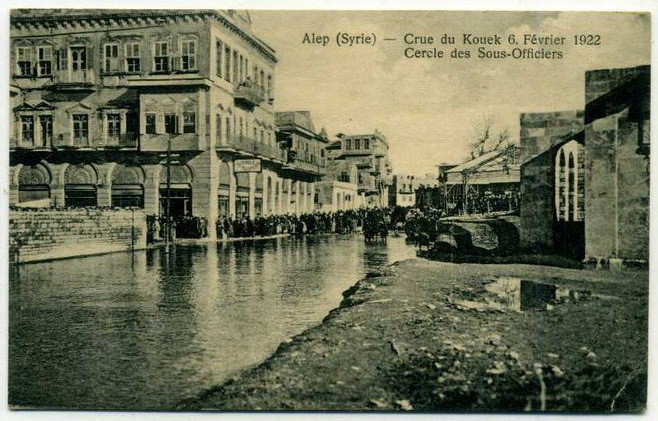 In some cases, cities grew in locations where the climate was more temperate due to altitude (Amman, Aleppo, Sana’a, Taif). In at least two cases – Jerusalem and Mecca – it was spiritual significance that drove city growth. 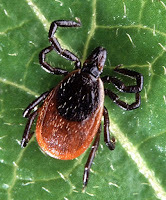 WFLA.com: Lyme disease is gradually spreading from the Northeast and becoming more common farther south and west, government researchers reported Wednesday. A county-by-county look at the infections shows it’s found in four times as many counties now as it was in 1993, a team from the Centers for Disease Control and Prevention found. It’s not clear why – experts say climate change, forest regrowth and the spread of deer might all be factors. What is clear is that many more people than before need to watch out for the ticks that carry the infection, CDC says. Suzanne Goldenberg in the Guardian (UK): The warming of the oceans due to climate change is now unstoppable after record temperatures last year, bringing additional sea-level rise, and raising the risks of severe storms, US government climate scientists said on Thursday. The annual State of the Climate in 2014 report, based on research from 413 scientists from 58 countries, found record warming on the surface and upper levels of the oceans, especially in the North Pacific, in line with earlier findings of 2014 as the hottest year on record. Global sea-level also reached a record high, with the expansion of those warming waters, keeping pace with the 3.2 ± 0.4 mm per year trend in sea level growth over the past two decades, the report said. Scientists said the consequences of those warmer ocean temperatures would be felt for centuries to come – even if there were immediate efforts to cut the carbon emissions fuelling changes in the oceans. The Insurance Journal: Catastrophe modeling firm AIR Worldwide has released an analysis of Typhoon Nangka, which is currently a Category 3 storm “with a central pressure of 950 mb and maximum 10-minute sustained wind speeds of 80 knots (~106 mph 1-minute sustained). 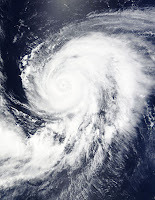 The storm is located approximately 1,250 km (775 miles) from Iwakuni, Japan, Nangka, and is moving northward at 15 km/h (9 mph). “Once the intensity of a Category 4 Super Typhoon, Nangka has weakened and maintained its current intensity for the last 72 hours,” said Dr. Anna Trevino, scientist at AIR Worldwide. “It is located in a favorable environment with very little vertical wind shear and warm sea surface temperatures, but nearby dry air is being wrapped into the center, preventing further convective growth and intensification. A press release from the Helmholtz Centre for Ocean Research-Kiel: Due to climate change, not only atmospheric, but also oceanic, temperatures are rising. 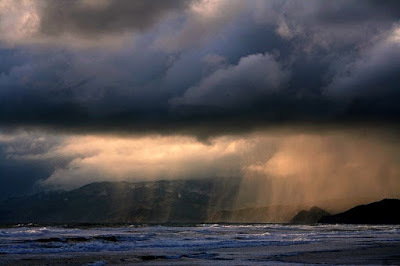 A study published in the international journal Nature Geoscience led by scientists at the GEOMAR Helmholtz Centre for Ocean Research Kiel shows that increases in sea surface temperature can contribute to the development of stronger precipitation events. Their findings are underpinned by flash-flooding in June in the Olympic city of Sochi, Russia. That the temperatures on our planet are rising is clear. In particular, the increasing emissions of greenhouse gases such as carbon dioxide continue to warm the atmosphere. The effects of global warming on the hydrological cycle, however, are still not fully understood. Particularly uncertain is how the strength of extreme summertime thunderstorms have changed, and how it may change in the future. In coastal regions neighboring warm seas, the sea surface temperature can play a crucial role in the intensity of convective storms. The Black Sea and eastern Mediterranean have warmed by about 2 C since the early 1980s. Russian and German scientists investigated what impact this warming may have had on extreme precipitation in the region. “Our showcase example was a heavy precipitation event from July 2012 that took place in Krymsk (Russia), near the Black Sea coast, resulting in a catastrophic flash food with 172 deaths”, said Edmund Meredith, lead author of the study. “We carried out a number of very-high-resolution simulations with an atmospheric model to investigate the impact of rising sea surface temperatures on the formation of intense convective storms, which are often associated with extreme rainfall”, Meredith continued. Simulations of the event with observed sea surface temperatures showed an increase in precipitation intensity of over 300%, compared to comparable simulations using sea surface temperatures representative of the early 1980s. “We were able to identify a very distinct change, which demonstrates that convective precipitation responds with a strong, non-linear signal to the temperature forcing”, Prof. Douglas Maraun, co-author of the study added. At the end of June 2015, the nearby Olympic city of Sochi experienced an unusually intense precipitation event. 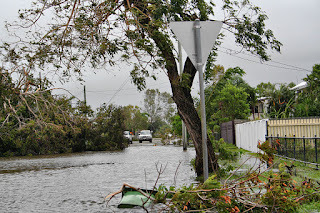 Over 175 mm of rain was recorded in 12 hours, showing the relevance of the scientists work. “Due to ocean warming, the lower atmosphere has become more unstable over the Black Sea and eastern Mediterranean. We therefore expect that events like those in Krymsk or Sochi will become more frequent in the future”, added the Kiel-based climate scientist. Kagondu Njagi at the Thomson Reuters Foundation: At 16 years of age, Nagirasia Lengima is already a mother of two. But parenthood doesn't stop her from indulging in her latest passion: school. Like a growing number of girls from nomadic communities in northern Kenya, Lengima is defying cultural prejudices - and climate pressures - by getting an education at a mobile school. Run by non-profit groups, the schools bring learning to girls whose families are forced to move around the region to survive. In Laisamis village, Marsabit County, at a school run by the Nairobi-based development charity Adeso, it is Lengima's turn to demonstrate what she has picked up from the morning session. After playing around with some numbers on the chalkboard, she elicits cheers from the 59 other pupils in the class as she produces the answer with a double stroke. 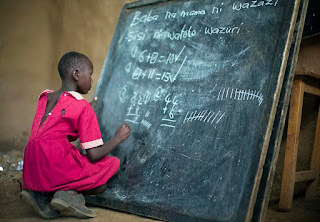 "Mathematics and Kiswahili are my favourite subjects," said Lengima. "I want to go into business in the future." But circumstances are conspiring against her. Teachers have largely abandoned the area to escape sporadic attacks by Islamist militant group Al Shabaab. And increasingly erratic weather often pushes pastoralist families away from their settlements in search of water and grazing, limiting children's access to formal education. Brad Allen at edie.net: The insurance industry should be forced to protect citizens at risk from climate change, a new report from the University of Cambridge's Institute for Sustainability Leadership (CISL) has claimed. The report, titled Insurance regulation for sustainable development, analysed the role of the insurance industry in protecting societies against climate risk. It found that, as well as providing financial protection, insurers could encourage people to better protect themselves from climate risks through incentives in insurance contracts. The industry also has a unique expertise in identifying and mitigating risk, argued the report, while the global nature of insurance markets would help to spread the financial impact of climate disasters, especially for poor regions. As a result, the report urges policy makers to “utilize insurance regulation as an essential policy instrument to protect populations and assets from climate risks”. Adam Vaughn in the Guardian (UK): Nearly 9,500 people die early each year in London due to long-term exposure to air pollution, more than twice as many as previously thought, according to new research. The premature deaths are due to two key pollutants, fine particulates known as PM2.5s and the toxic gas nitrogen dioxide (NO2), according to a study carried out by researchers at King’s College London. The study – which was commissioned by the Greater London Authority and Transport for London – is believed to be the first by any city in the world to attempt to quantify how many people are being harmed by NO2. The gas is largely created by diesel cars, lorries and buses, and affects lung capacity and growth. London, Birmingham, and Leeds are among the UK cities that have been in breach of EU safety limits on NO2 for five years, prompting legal action that led to a supreme court ruling in April that the government must publish a clean-up plan by the end of the year. University of Florida News: When past temperatures were similar to or slightly higher than the present global average, sea levels rose at least 20 feet, suggesting a similar outcome could be in store if current climate trends continue. Findings published in the journal Science showed that the seas rose in response to melting ice sheets in Greenland and Antarctica, said lead author Andrea Dutton, a University of Florida geochemist. “This evidence leads us to conclude that the polar ice sheets are out of equilibrium with the present climate,” she said. 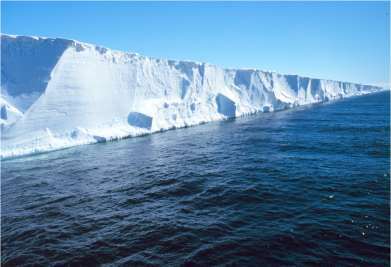 Dutton and an international team of scientists assessed evidence of higher sea levels during several periods to understand how polar ice sheets respond to warming. Combining computer models and observations from the geologic record, they found that during past periods with average temperatures 1 to 3 °C (1.8 to 5.4 °F) warmer than preindustrial levels, sea level peaked at least 20 feet higher than today. 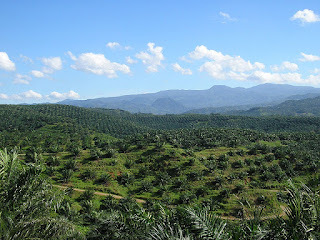 A press release from the University of Minnesota: Draining tropical peatlands for oil palm plantations may result in nearly twice as much carbon loss as official estimates, according to a new study by researchers from the University of Minnesota Institute on the Environment and the Union of Concerned Scientists in the journal Environmental Research Letters. sands of years as carbon storage systems. In Southeast Asia, peat swamp forests cover about 250,000 square kilometers, a land area about the size of Michigan. 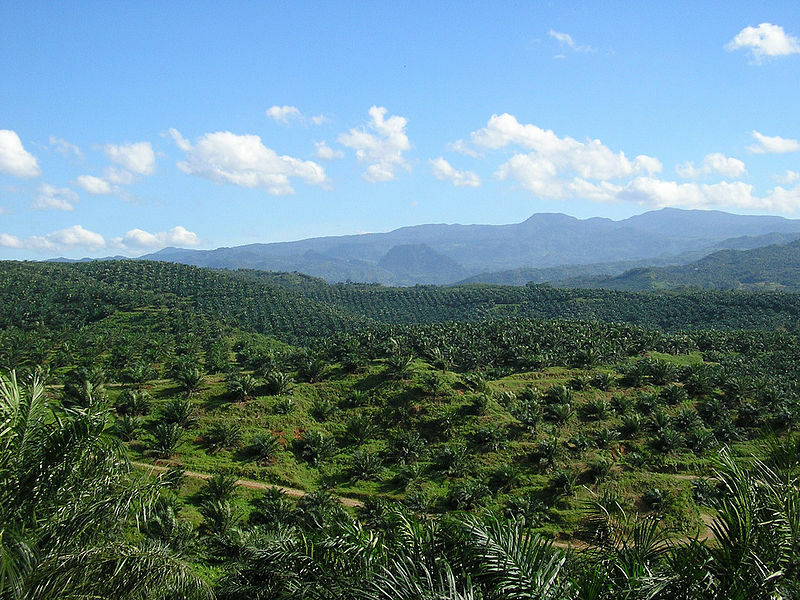 In the past 15 years, peatland forests have been rapidly drained and cleared to make way for oil palm and pulpwood plantations. Draining exposes the upper peat layer to oxygen, raising decomposition rates and soil carbon losses. 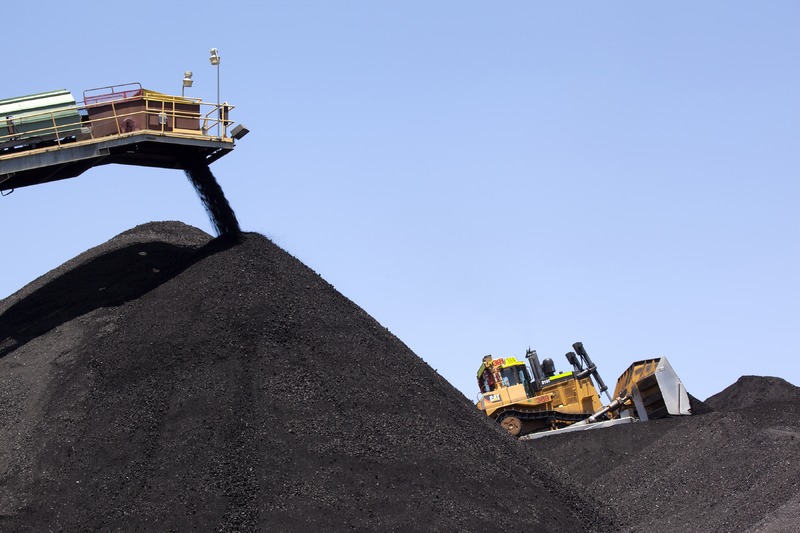 Most of that carbon is emitted to the atmosphere, speeding up climate change. Kimberly M. Carlson, a postdoctoral research scholar with IonE’s Global Landscapes Initiative, and UCS researchers Lael K. Goodman and Calen C. May-Tobin designed their research to support site-specific greenhouse gas emissions assessments in tropical plantations. “We wanted to know whether water table depth could be used as a proxy for soil carbon loss in peatland plantations,” Carlson explained. ...The study, a comprehensive analysis of scientific literature on tropical plantation peatland carbon balance, found a correlation between long-term water table depth (the distance from the soil surface to the water surface) and soil carbon loss rate. This finding suggests that peat water table monitoring could help companies more accurately measure their greenhouse gas emissions. 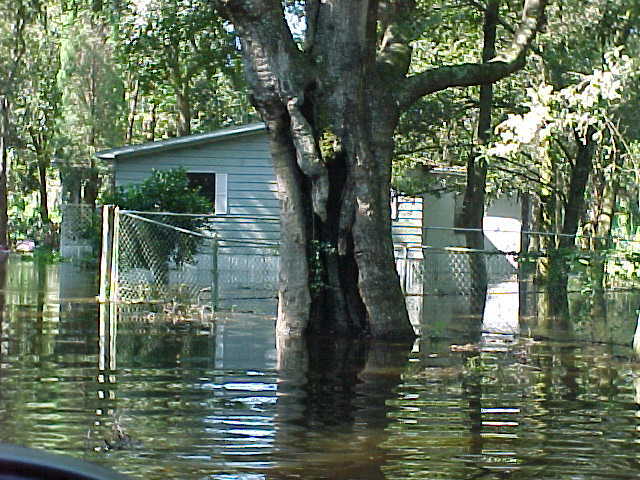 The researchers compared two measurements of carbon loss: subsidence and mass balance. To find the subsidence rate, scientists measure how much the land has sunk over time and how much carbon is stored in the soil. Subsidence models alone cannot inform the global warming potential of peatland drainage. For the lowest part of the stratosphere - i. e. the layer between 10 and 16 kilometres - little information was available so far, but now the international IAGOS-CARIBIC climate project combined with satellite observations from the CALIPSO lidar provided new essential information. 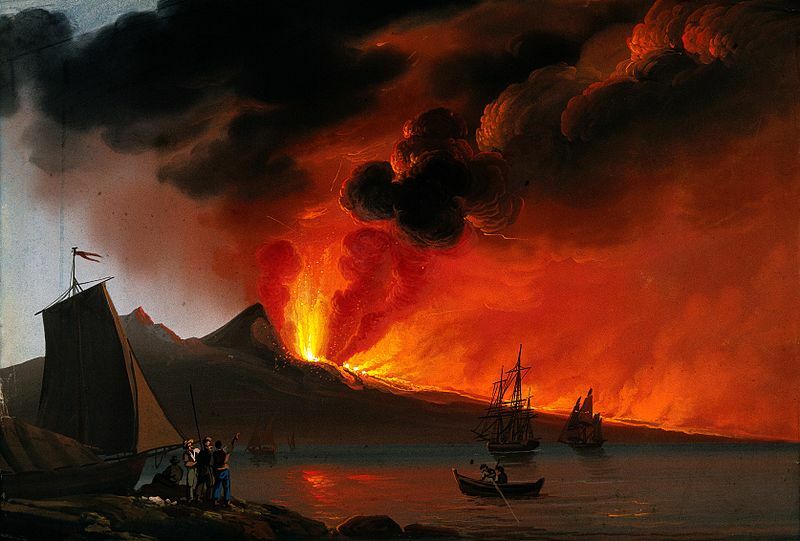 According to the study, the cooling effect due to volcanic eruptions was clearly underestimated by climate models used for the last Intergovernmental Panel on Climate Change (IPCC) report. MPI-C), the Leibniz Institute for Tropospheric Research in Leipzig (TROPOS) and the Karlsruhe Institute of Technology (KIT). Since more frequent volcanic eruptions and the subsequent cooling effect are only temporary the rise of Earths' temperature will speed up again. The reason is the still continuously increasing greenhouse gas concentration, the scientists say. Suzanne Goldenberg in the Guardian (UK): Public health experts involved in the response to the Ebola crisis have condemned what they described as a ludicrous, insulting and opportunistic attempt to exploit the disease for corporate gain by the world’s largest privately-held coal company. As part of a PR offensive to rebrand coal as a “21st-century fuel” that can help solve global poverty, it has emerged that at the height of Ebola’s impact in Africa, Peabody Energy promoted its product as an answer to Africa’s devastating public health crisis. Greg Boyce, the chief executive of Peabody, a US-based multinational with mining interests around the world, included a slide on Ebola and energy in a presentation to a coal industry conference in September last year. 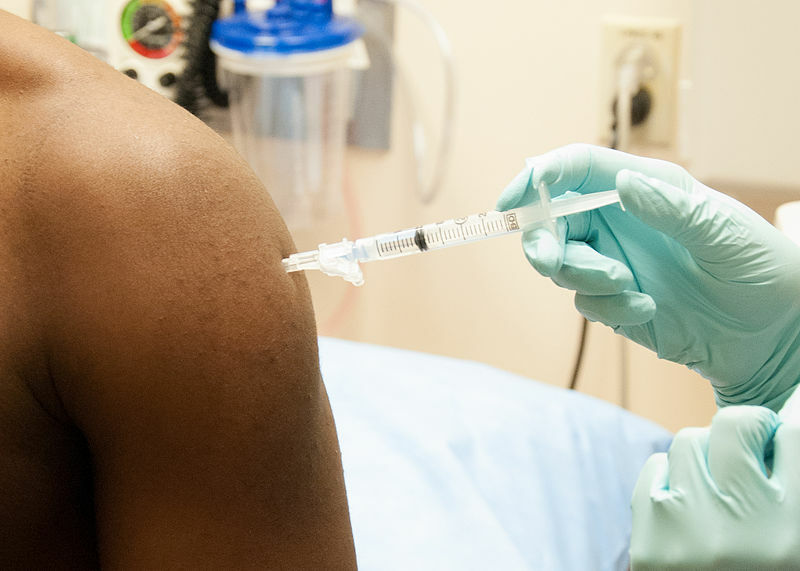 The slide suggested that more energy would have spurred the distribution of a hypothetical Ebola vaccine – citing as supporting evidence a University of Pennsylvania infectious disease expert. an 11,000 died – although the international agency believes that is probably an underestimate. CBC News: The fires burning in northern Saskatchewan could burn until the first snowfall, according to researchers. Kerry Anderson, a research scientist with the Canadian Forest Service, said the weather pattern known as El Nino, which is caused by the warming of the Pacific Ocean off the coast of South America, is responsible. He expects weather conditions will settle down in Saskatchewan in the coming weeks, but warmer than normal temperatures will likely persist in B.C. and Alberta. Anderson said even if crews bring the Saskatchewan fires under control, they may not actually be out until the fall. "The large fires that are burning there will continue to burn until they are contained or until a fire-ending event may occur, and that may just end up being the first snowfall." Fire rages near Mark Paquette's cabin on Nemeiben Lake. Late on July 8, 2015, Paquette said his cabin had been spared. 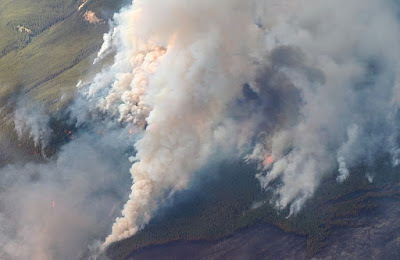 (Submitted by Mark Paquette) Wildfire expert Mike Flannigan said tinderbox conditions that have lead to the destructive fires in the West can be blamed on climate change. Jerome Taylor in Seed Daily via AFP: ...Thailand's vital rice belt is being battered by one of the worst droughts in living memory, forcing impoverished farmers deeper into debt and heaping fresh pain on an already weak economy -- seen as the junta's Achilles heel. When they seized power in May 2014, Thailand's generals promised to restore order and prosperity after months of street protests paralysed the elected government of Yingluck Shinawatra and brought the economy to a near standstill. By severely curtailing civil liberties, former army chief turned Prime Minister Prayut Chan-O-Cha has largely managed to renew calm. But the generals have proven less adept at kickstarting what was once one of Southeast Asia's most vibrant economies. Post-coup gains of a rebound in tourism and increased fiscal spending have been offset by disappointing exports, declining manufacturing and weak local demand. In May the country's economic planning agency further revised down its GDP growth forecast for the year to between 3.0-4.0 percent, one of the lowest rates in Asia and well below Prayut's hopes for at least 4.5 percent. Now the kingdom faces the prospect of a dismal main harvest of rice -- traditionally one of the country's top exports. June 2010 – I served as a consulting editor to a the New York City Panel on Climate Change final report, published as Climate Change Adaptation in New York City: Building a Risk Management Response through the New York Academy of Sciences. You've seen this report in the news in the aftermath of Hurricane Sandy. June 2009 – At the studios of Cleanskies TV, I was interviewed about the costs of climate change, and discussed adaptation efforts underway in the US and around the world. May 2009 – I helped draft the scenarios for Rising Waters, a multistakeholder scenarios effort focused on climate change adaptation in the Hudson Valley. The final report is now completed and available here. November 19, 2008 – Cut carbon emissions and still save money right away? It can be done if you know where to start, as I explain in a Climate Biz column. July 31, 2008 – Check out this wide-ranging interview about climate justice, resilience, disasters and more on Cleanskies.tv. July 2008 – Carbon taxes are so much better than emissions trading for cutting greenhouse gases, and yet politically cap-and trade is the winner. Find out why at Climate Biz. May 2008 – I reviewed two books on climate and energy in the New Leader magazine: James Gustave Speth's The Bridge at the Edge of the World: Capitalism, the Environment and Crossing from Crisis to Sustainability, plus Robert Bryce's Gusher of Lies: The Dangerous Delusions of Energy Independence. January 2008 – A very local paper covers a very global issue.... The Litchfield County Times in northwestern Connectictut ran an article in January 2008 about Carbon-Based.